It’s been a year since I opened my Twitter account in the early morning hours, to read the pleas of strangers from Houston whose desperation compelled me to find a way to help. And I did find ways, through specific hashtags that emerged on Twitter, in the form of #HarveySOS and #HarveyRescue, just as there were helpers on the ground, so too were there helpers online. Through the flurry of tweets, I saw that even the helpers needed help. So I volunteered, and after a week of all of us working through long days and sleepless nights, I was surprised and amazed at what a group of determined individuals can do to help others. One year later, I’m still wondering how that single mother or that elderly couple are doing, the first individuals whose rescue I helped facility. They were the first individuals I helped. In the hours and days that followed there would be many more. I’ve said prayers for all of them many times, hoping they were well and finding comfort and healing in their communities. There’s a part of me that still wonders how they are still today. On the days I needed reassurance that they’re okay, I went to Twitter and followed the hashtag #HoustonStrong. There, I found inspiration seeing the drive, determination and resilience they found in their community. That reassurance has allowed me to move on spiritually and emotionally, and to continue to help others. I am grateful that I could use my skills and knowledge to be of service, just as others were there for me, when I went through Hurricane Sandy. One lesson I learned from the volunteer calls last year, and from watching Houston’s progress, is that it’s important to continue to talk and share our thoughts and feelings long after the event is over in order to process the lingering impact. 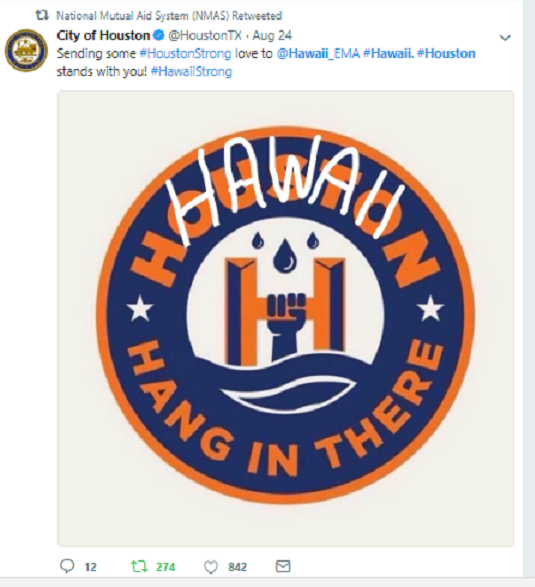 Seeing the City of Houston’s tweet this morning brought tears to my eyes, because they know full well exactly what everyone in Hawaii is going through. Through that tweet I finally realized why we continue being disaster volunteers in some form or another: because we know we can make a difference by reaching out and supporting others through their crisis, just as Houston did this morning. So today I want to thank my fellow Harvey volunteers, for caring enough to do the impossible with very little, for remaining undaunted by the challenge, and for stepping up to help. I especially want to thank and salute Houstonians for their resilient spirit and drive, which continues to inspire me each day. 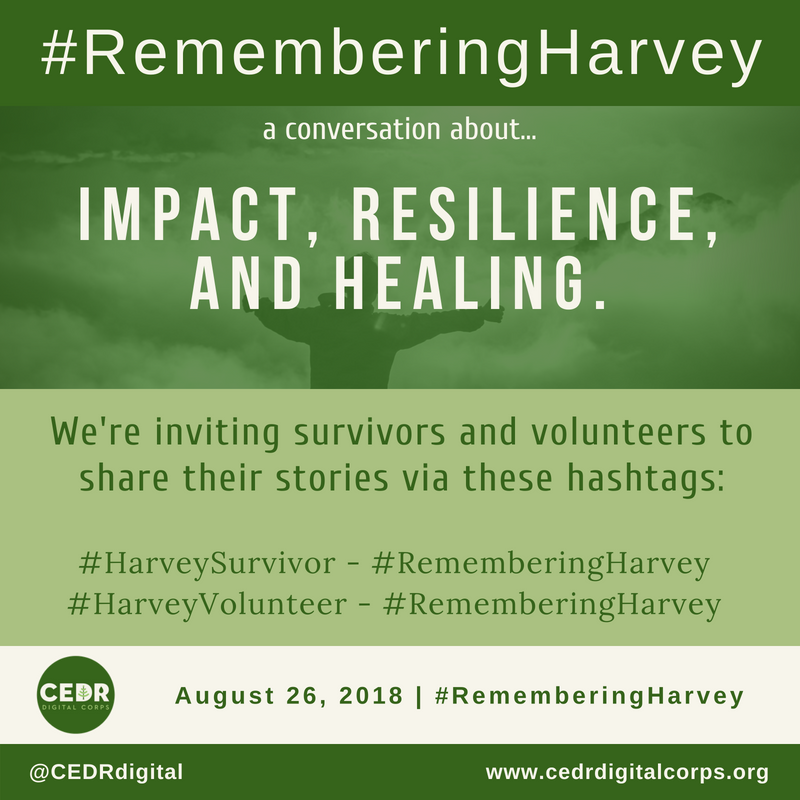 Now I hope you’ll share your story of impact and resilience with us, and through sharing, in the comments or via twitter we can all continue healing together. Let us know how you’re doing using the hashtags below. It may be a year later, but we all still care. I remember seeing the water on TV. So much water covering streets, trees cars and houses and with no place to go. If you remember Hurricane Katrina you couldn’t help but see the parallels and hope for a better outcome. There was a better outcome, instead of people climbing on their roofs to post “SOS” signs on their sheets, they turned to Facebook and Twitter to ask for help and the call was heard, people noticed and started organizing themselves to track info, call people and get the info to the rescue orgs. I clicked on a link to an online spreadsheet during Harvey, curious to see what was going on, and saw at least a thousand lines of people and animals needing rescue and help. More importantly, it looked like the calls for help were being answered. Think about that. A group of strangers self-organize, gather information and get it to rescue groups who take them seriously and take action. That’s amazing and shows the power of social media for good.